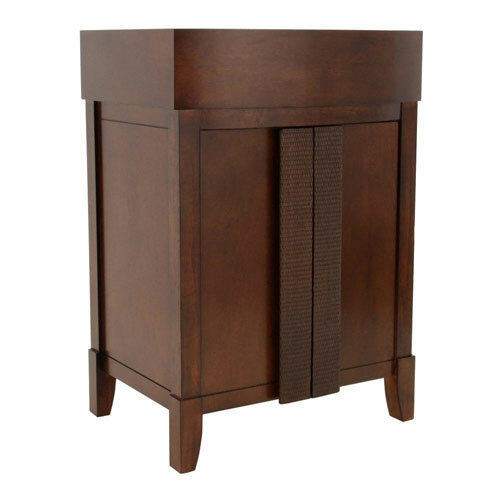 The American Standard Tropic 24-inch Vanity Cabinet Only in Nutmeg offers a traditional-styled cabinet with an Asian flair to give your bathroom an exotic appearance. The cabinet's poplar and birch construction ensures long-lasting use and enjoyment. Its narrow dimensions make this an ideal vanity for small bathrooms and lavatories or where space is tight. Yet, it offers plenty of storage space for your bathroom essentials behind 2 doors that feature rattan door pulls combining style with functionality. Item Boxed Weight: 28 lbs.